Periodontics, Implants and Restorative Dentistry (Beverly Hills) - Book Appointment Online! 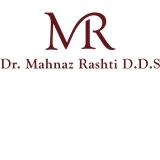 Dr. Mahnaz Rashti specializes in the most advanced of cosmetic dentistry, implant dentistry, and periodontal disease treatments.She addresses various concerns through her expertise in periodontal disease prevention, pocket reduction, bone regeneration, tooth extraction, dental implants, crown lengthening, bone grafting, ridge augmentation, soft tissue graft, and more. She has received several awards highlighting her extensive background in the field. We gladly welcome your presence at our office. I have been going to her for a year, I needed? major work done . No pain ,very knowledgeable, and highly skilled and I'm very pleased with her work and She also checked in with me to make sure I was ok from time to time.